If there’s one food that defines on-the-go snacking, it’s jerky. 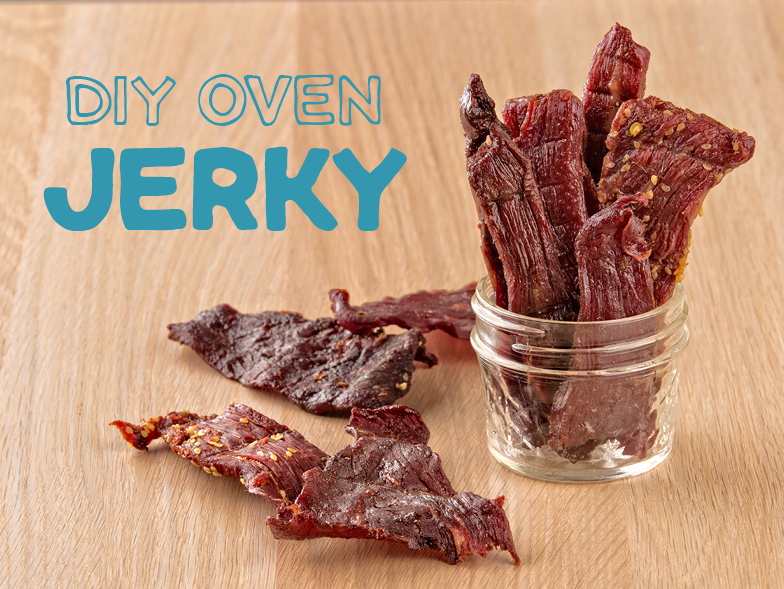 But, did you know you can make your favorite jerky at home, even without a dehydrator? All you need is a few simple ingredients and your oven. Follow these simple steps below—including some of the tastiest marinade recipes—and you’ll have a portable snack in no time. First and foremost, you have to choose a meat. Beef is the most common type of jerky, but anything without a lot of connective tissue, such as turkey, will work just fine. Once you’ve picked out your meat, slice it into 1/8”—1/4” slices—with the grain for chewy jerky, against the grain for tender jerky. The possibilities for flavoring your jerky are endless. Here are a few marinades that are always a hit. Each recipe allows for 2½ pounds of lean meat, thinly sliced. Simply mix the ingredients in a plastic bag, add your meat, and marinate for up to 48 hours in the refrigerator. Tasty Traditional- For this classic marinade, combine ⅓ cup soy sauce, 2 tablespoons Worcestershire sauce, 1 tablespoon dark brown sugar, 1½ teaspoons black pepper, 1 tablespoon liquid smoke, 1 tablespoon dried minced onion, 4 cloves minced garlic, ¼ cup balsamic vinegar, and 1 tablespoon curing salt. Sweet Southern Honey- Use this marinade if you like your jerky a little sweet! Just mix together 1 tablespoon liquid smoke, 1 tablespoon molasses, 2 tablespoons dark brown sugar, 2 cloves minced garlic, 1 teaspoon sea salt, 1 teaspoon mustard powder, 1 teaspoon cracked black pepper, ¼ cup ketchup, and ⅓ cup honey, and 1 tablespoon curing salt. Terrific Teriyaki- For Asian-inspired jerky, combine ¼ cup sesame seeds, 4 cloves minced garlic, 1 tablespoon fresh ginger, chopped, 2 Serrano peppers, chopped, ¼ cup soy sauce, ⅓ cup frozen orange juice concentrate, 1 tablespoon liquid smoke, 2 tablespoons Worcestershire sauce, and 1 tablespoon curing salt. Blissful BBQ- Give your jerky the tangy taste of BBQ with this marinade. Simply mix together 1 cup ketchup, ½ cup water, 2 tablespoon Worcestershire sauce, ⅓ cup balsamic vinegar, 2 tablespoons dark brown sugar, 1 teaspoon ground mustard, 1 teaspoon black pepper, 1 teaspoon onion powder, 2 cloves minced garlic, ½ teaspoon paprika, ½ tablespoon lemon juice, 1 tablespoon liquid smoke, and 1 tablespoon curing salt. Preheat your oven on its lowest setting, then cover a baking sheet with aluminum foil and place a baking rack on top. Place the meat in a single layer on top of the rack. Put the baking sheet in the oven, and hold open the oven door with a wooden spoon to allow moisture to escape. Let the meat dry for 4-6 hours, then remove from the oven. Once the jerky has cooled (but is still slightly warm), place the pieces in a resealable plastic bag. Your homemade jerky will be good for about 3 months—if you manage not to eat it in that time!